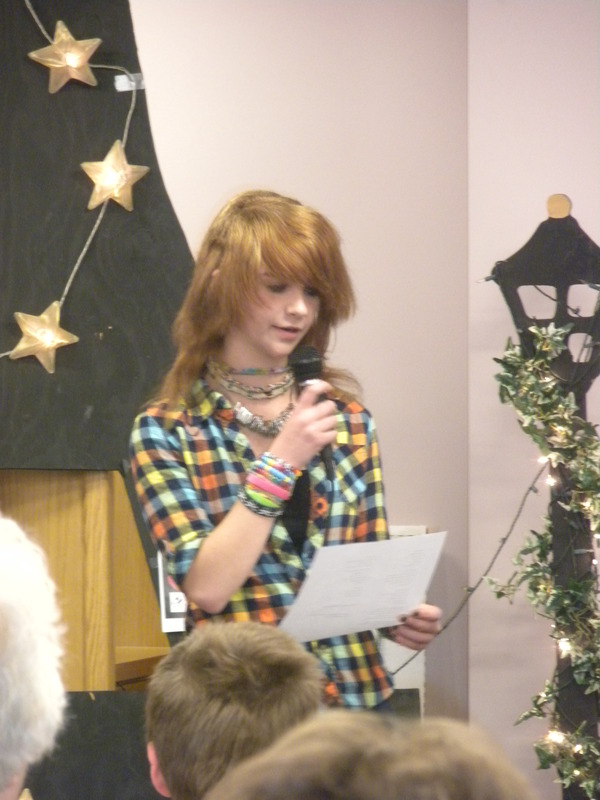 Funding from the Phoebe Dimock King and Elizabeth C.King Eaton has allowed the Foundation to hold a wide-ranging group of programs at the Tolland Public Library through its “Year of the Young Adult” intiative. These included college admissions workshops, sessions on how to pay for college, visits by an astronomer and young adult authors and the library’s first poetry slam, on April 27, 2012. 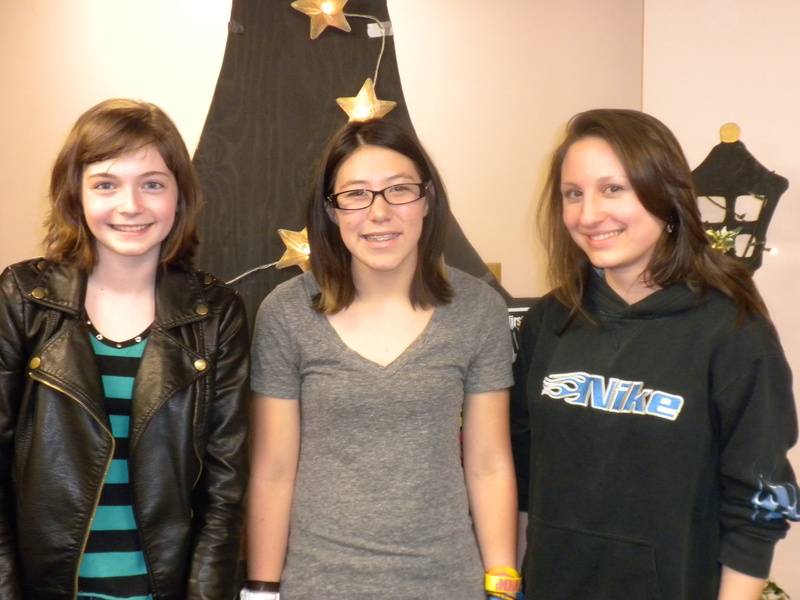 The second slam will be held April 26, 2013 from 6:30 p.m. to 8:30 p.m.
Poetry slam winner Alianora Reilly, left, with second-place winner Kate-Lynn Walsh, center, and the third-place finisher, Julia Rose Gottier. For three nights in a row in September 2012, astrophysicist Kevin Manning amazed families with tales of the universe as the public libraries in Tolland, Willington and Ashford joined forces to bring his “Look Up to the Stars” program to eastern Connecticut. Manning, a retired NASA consultant, presented three different programs on astronomy thanks to this unusual partnership between the Tolland Public Library, the Willington Public Library and the Babcock Library in Ashford. Is the Earth doomed on Dec. 21, 2012? Is the ancient Mayan calendar that predicts its demise correct? Manning will reveal the fiction and the truth about doomsday predictions. His visit to the library at 21 Tolland Green is sponsored by the Tolland Public Library Foundation as part of its “Year of the Young Adult” initiative to bring more young adults back to their public library. When you wish upon a star, wouldn’t it be nice to know which star it is and what constellation it lies in? Manning will offer hands-on activities using star charts to identify key objects in the night sky. His visit is sponsored by the Friends of the Willington Public Library. 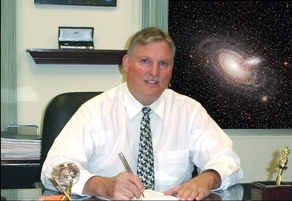 Manning will explain the size of the universe and describe celestial wonders using hands-on activities. His visit, to be held at the library at 25 Pompey Hollow Road, is made possible by the Friends of the Babcock Library.